Discussion and research relevant to mineral exploration. An introduction to fluid inclusions and mineral exploration applications. A suite of samples was collected during the Symposium tour of the mine and analysed by fluid inclusion decrepitation with a particular view to shedding light on the nature of the silicified zone at the Jackrabbit. There was intense discussion as to wether this was a chert or siliicification due to later introduced fluid overprint. Samples 1365 and 1372 were form the "silicified" zone at Jackrabbit, and both samples contained quartz veinlets in hand specimen. They were acid washed to remove carbonate and analyses show both samples contain a weak decrepitation response, probably due to inclusions within the quartz veinlet material. 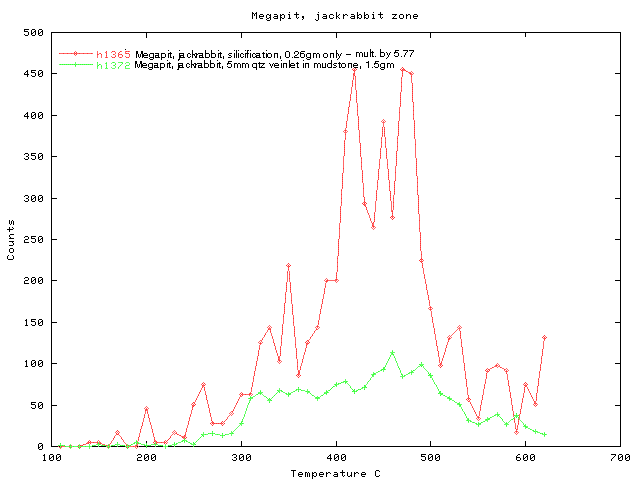 I conclude that there has been a thermal fluid overprint in the Jackrabbit zone, with fluids of some 300 C,. Both these samples were primarily of carbonate, and after acid washing very little material was left to analyse. This is why sample 1365 is "noisy" as I had only 0.26 grams of acid resistant material remaining to analyse instead of the normal 1.5 grams. At the North end of the Megapit silicified host rock samples with veinlets present again showed weak decrepitation. Note that sample 1263 seemed to lack quartz veining and also gave no decrepitation response. This sample shows only instrument background levels. (Chert samples show results like this - no response at all). At the Vista pit I collected 4 samples of quartz veins. These samples show moderate to strong decrepitation, typical of quartz. 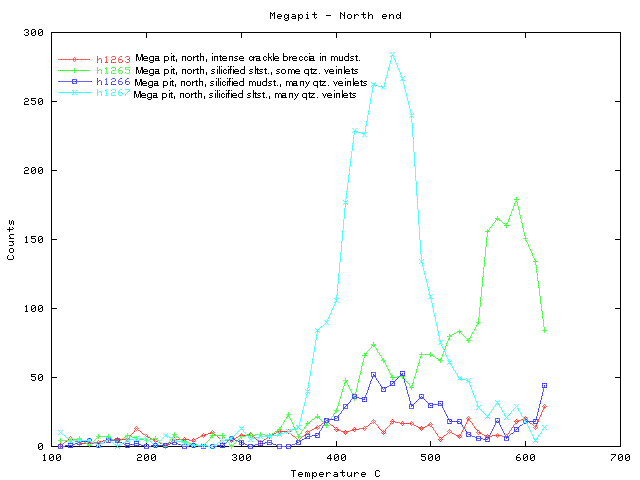 Note the change of scale of the counts axis compared to the megapit silicification samples. Sample 1370 shows a prominent seperate peak near 300 C, which is due to the presence of CO2 rich fluids in the inclusions. This indictaes that the source fluids for these veins were derived from great depth or from a magma. Fluids from Carlin style deposits do not contain CO2. 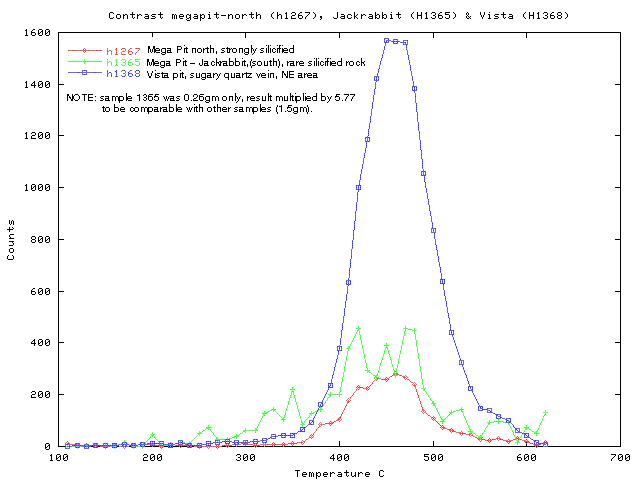 Samples 1369 and 1371 also show traces of CO2 rich fluids, while sample 1368 lacks this characteristic. In doing these analyses it is necessary to remove carbonate from the samples as this swamps the decrepitation result. Samples 1264 and 1367 (below) show this effect, as they were not subjected to enough acid to completely dissolve the carbonate. In this area, the carbonate contamination renders the decrepitation result useless. (Although in other exploration areas, carbonates can be used for decrepitation comparisons). Samples 1366 and 1372 were actually the same hand specimen (1926B), but 1366 was inadequately treated with acid and was re-washed giving sample 1372. 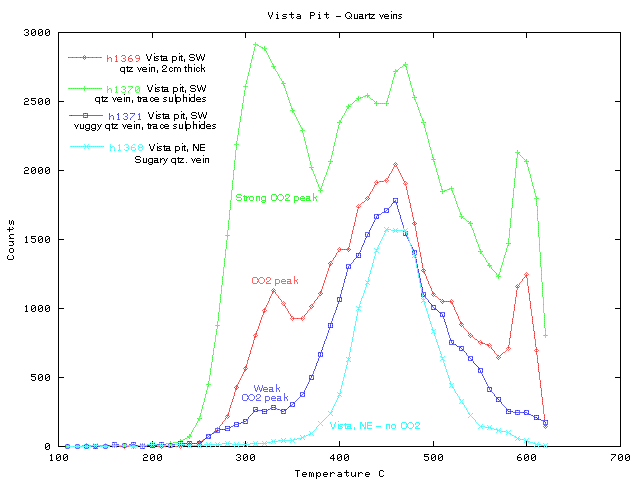 Note the great difference in response as the carbonate conceals the quartz response in 1372. 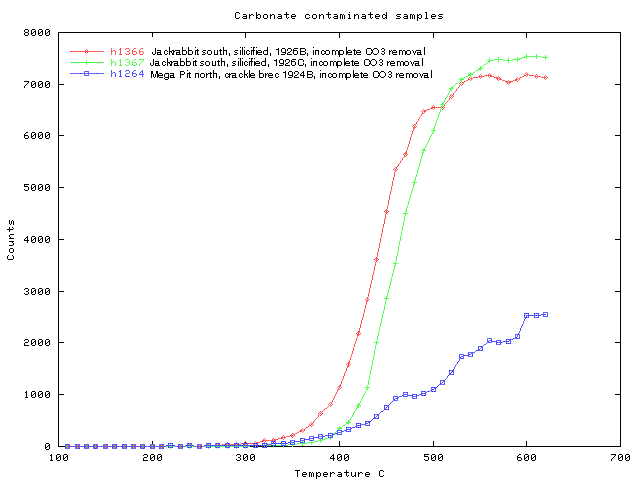 Because of the immense scale change these 2 results cannot be plotted together, so see them in their seperate plots above sample 1366, carbonate contaminated (red) and its re-washed and clean equivalent sample 1372, carbonate free .(green). 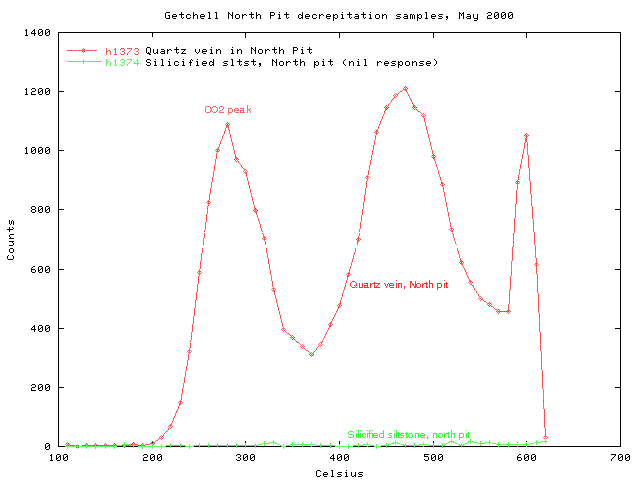 For comparison, one quartz sample from the nearby Getchell mine showed a substantial CO2 peak. The Getchell mine and the Vista pit are several kilometres apart with limited outcrop between them. Decrepitation from samples at the two areas shows considerable similarity, and it is considered that these 2 deposits are part of the same mineralising system. These CO2 rich fluids probably are related to a nearby granitic pluton as the source of fluids and mineralisation in the area. Decrepitation analysis of samples from Twincreeks gives a quick and economic way of deriving information from the fluid inclusions which can be useful in understanding and exploring for such deposits. Samples from the Jackrabbit zone show that there has been an overprint by a thermal fluid in this area, and this fluid matches the characteristics of the fluid which caused the much more prominent quartz veining in the Vista pit. This fluid was also identiffied in samples from the north end of the Megapit. It is notable that this fluid had a high CO2 content, implying a deep seated source, either of metamorphic or granitic derivation. In this area, the granitic origin seems more likely, which agrees with comments in the paper in Econ. Geol by Groff et. al. However, the existing suite of samples is not extensive enough to be able to answer whether or not the observed high temperature fluids were responsible for the Au mineralisation. A more careful pattern of sampling may assist with answering that question. The presence of decrepitation on samples from the Jackrabbit zone indicates that this is not merely a chert, as chert samples do not produce fluid inclusion decrepitation. (Sedimentary cherts formed from surface fluids do not contain detectable fluiid inclusions.) However, all the samples collected were highly calcareous and dissolved almost completely in acid, so there was not really much if any silicification, (or chert) other than the observed quartz veinlets. Perhaps this zone is simply a more massive calcareous horizon, overprinted with abundant quartz veinlets. Note that when I collect samples I specifically search for siliceous or quartz bearing samples so my samples are biased . Non-siliceous samples would not preserve the fluid inclusions and would not be useful for fluid inclusion decrepitation analysis. As might be expected, these samples are very similar to the one sample collected from the Getchell area and fluid sources for both areas appear to be similar. 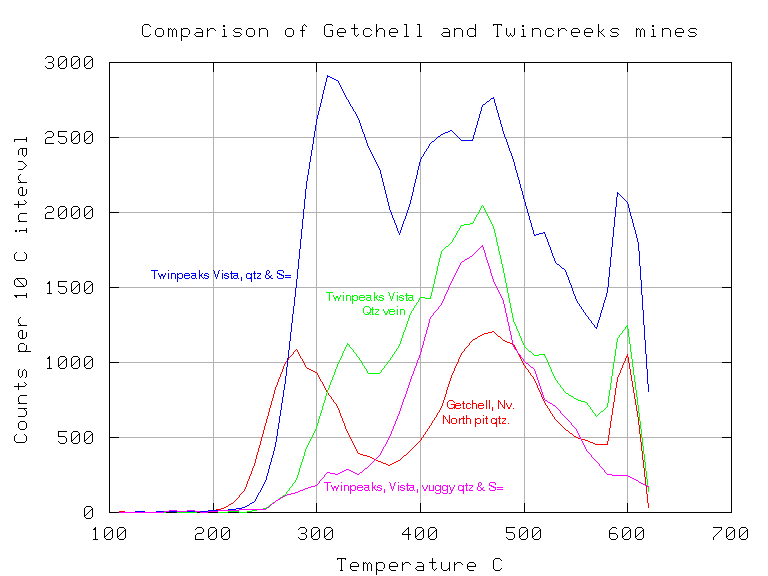 Note that quartz samples do not usually show such similarity over these distances as most quartz is strongly zoned and decrepitation response can vary immensely over 10s of metres, so the noted similarity of Getchell and Twin Creeks is a significant observation.